It is always good to keep your readers engaging then whether you got few hundred readers or hundred thousand readers with you. The best to have is the newsletter management system on place which will help you achieve all the things under one hood, then whether creating your newsletter list or emailing your readers straight away once the content goes live on your blog. To have such system, you would be requiring a plugin so that your readers can sign-up directly. In this article, you will find nine such amazing WordPress plugins for newsletter management. Send emails to your existing wordpress members. Sidebar widgets so people can subscribe to your newsletters and view previous newsletters. UTF -8 support for multi-lingual newsletters. Double opt-in confirm link to new members. An overlay on sent newsletters showing which links were clicked. Pause sending out a newsletter, resume at a later time. Members can manage their subscriptions through wordpress profile. Modern Opt-in form: popup box contains HTML5+CSS3 AJAX-ed opt-in form. Highly customizable window: set window size, window and overlay colors, background image, font scheme color, overlay opacity, content, number of widget areas, autoclose time and even edit CSS. WYSIWYG editor: edit content with visual editor. Accept shortcodes: insert any shortcodes inside of popup box. Open on page load: display popup window when page is opened. Auto close delay: popup window might be closed with delay. Open on click: display popup when users click particular link. Display modes: you can display popup either for all pages of website, or for particular pages. Remember subscribed visitors: plugin set cookie on users machine to avoid repeated popups for subscribed visitors. Remember visitors: popup box can be displayed only once per visit. Show or hide close button: open popup box as modal window. Enable/disable popup for small screen devices: yes, it has such function too. Enable/disable “Name” field: you can request e-mails only. Modern and secure opt-in form: CSS3 AJAX -driven opt-in form. MailChimp supported: contact details can be submitted to MailChimp through their API . iContact supported: contact details can be submitted to iContact through their API . CSV Export: all data can be exported as CSV -file to be used with any newsletter systems. Shortcode driven: wrap protected content with shortcodes [subscribelocker]…[/subscribelocker]. Highly customizable: set size, colors, opacity, background image and even edit CSS. Modern popup window: shadows, round corners, etc. MailChimp, iContact, GetResponse and Campaign Monitor supported: contact details can be submitted to autoresponders through their API. 7 subscribe popup windows in one plugin: use them separetely or simultaneously without conflicts. Remember visitors: OnPageLoad and OnScrollDown popups can be displayed only once per visit. OnPageLoad autoopen and autoclose delay: you can configure these parameters too. Remember subscribed visitors: plugin remembers users who already shared the page (using cookie). Choose what page to share: users can share either current page or selected page. Whole website or selected pages: open popup box for whole website or for selected pages. Download link is sent to e-mail: users can’t cheat by entering fake e-mails. MailChimp, iContact, GetResponse, Campaign Monitor supported: contact details can be submitted to autoresponders through their API. Responsive design: opt-in form looks nice on small screens. Shortcode driven: insert shortcodes like [sdfile url=”http://download-url-here”]. Narrow mode: for sidebars use shortcode like: [sdfile url=”http://download-url-here” narrow=”1″]. WYSIWYG editor: edit intro content with visual editor. Accept shortcodes: insert any shortcodes inside of intro content. Allows users to subscribe and receive a newsletter containing the blog latest posts. 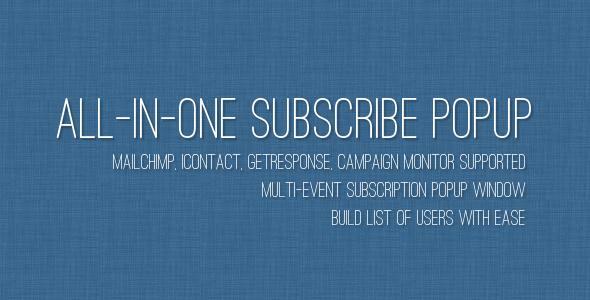 The newsletter subscription system features a double opt-in system, with email confirmation. Administrators can also activate subscribers. The newsletter can be sent regularly (weekly, monthly) or manually (anytime) and may contain any amount of articles. By customizing the newsletter template, one can send announcements, special offers and holiday messages. The newsletter allows sending of pages and custom post types.